The Town of Mamaroneck had another successful season of fun-filled camp programs. There were 670 children in the four different camps, including 72 campers in the popular Teen Travel Camp. In addition, there were entertaining concerts Monday evenings and outdoor movies at Memorial Park. The Town's Summer Conservation Crew, managed by Environmental Coordinator Liz Paul, worked on the conservation trails. One of the Crew's projects entailed the rebuilding of the steps on the steep incline of the Leatherstocking Trail near Fenimore Road. The Town will be installing eight electric vehicle charging stations at four locations. The charging stations are funded in part by grants from the New York State Department of Environmental Conservation which will cover 80% of the costs. The first charging station has just been installed at the Town Center parking lot. The three remaining charging stations will be located at the Hommocks Ice Rink parking lot, Myrtle Boulevard - next to the two-level parking lot (#3) and Baldwin Avenue/Memorial Park parking lot. The Town also purchased two electric vehicles at significantly discounted prices. In addition, we will receive $10,000 in state rebates for the cars. The Town's environmental committee, the Sustainability Collaborative, continues working to support legislation that will discourage the use of single-use plastic bags. A number of other Westchester County municipalities are doing so as well and several have already passed this legislation. 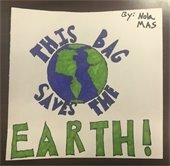 Earlier this year, the Town held a contest for students to design an environmentally-themed logo for reusable bags. The two winning selections are above. The reusable bags featuring these designs will be distributed to residents with the launch of the legislation later this year. Over the past several months, the Town Board evaluated whether to adopt legislation to allow residents to restructure their tax payments as charitable gifts. On August 23, 2018, the IRS issued proposed regulations to block attempts by New York, New Jersey and Connecticut to allow charitable tax contributions. The proposed IRS regulations also provide for a de minimis exception for a dollar-for-dollar state tax deduction and for a tax credit of 15% or less of the donation. Taxpayers who have made these contributions should consult their tax advisor. The IRS will likely challenge contributions made before the effective date although the proposed regulation is applicable to payments made after August 27, 2018. As a result of the IRS regulations, the Town Board has decided not to adopt the legislation that would enable residents to make charitable contributions. This month we honor Denise Dunn, an electric vehicle owner and resident who helped write the NYS Department of Conservation grant application for funding to install the electric vehicle charging stations. 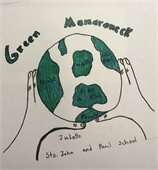 When Denise initially contacted me asking where to find electric chargers in the Town, I asked her if she would assist the Town in securing grant funding to install electric vehicle chargers.We sincerely appreciate Denise's efforts as well as her decision to join the Sustainability Collaborative. Wednesdays, September 26th and October 3rd. Work sessions begin in Conference Room A at 5:00 pm followed by the regular sessions at 8:00 pm in the Town Center Courtroom.